The Mahindra Scorpio has been one of the most popular SUVs in its segment. Even its pick-up truck variant, the Getaway, has found some takers. The Scorpio offers a sufficiently punchy motor along with enough street presence. However, there are some who want their Scorpio SUVs to look different. Hence, they take the custom route. Here are as many as 5 really bold mod jobs for the Mahindra Scorpio that you can opt for. Popular car customizer, SP Design Studio, offers a comprehensive makeover for the Scorpio. The SUV comes with an all-new grille with a wire mesh. You also get new custom headlamps that look a lot like the one on the Ford F150. The new bumper houses a set of fog lamps. The hood gets faux vents and the roof gets some LED auxiliary lamps. At the rear, the Scorpio gets a pick-up truck format with a covered cargo bay. The tail lamps have been updated to a single unit that includes both indicators and brake lights. Like the front, even the rear bumper is off-road spec. Other highlights include flared wheel arches, dual exhaust pipes and new alloy wheels shod with Maxxis off-road tires. 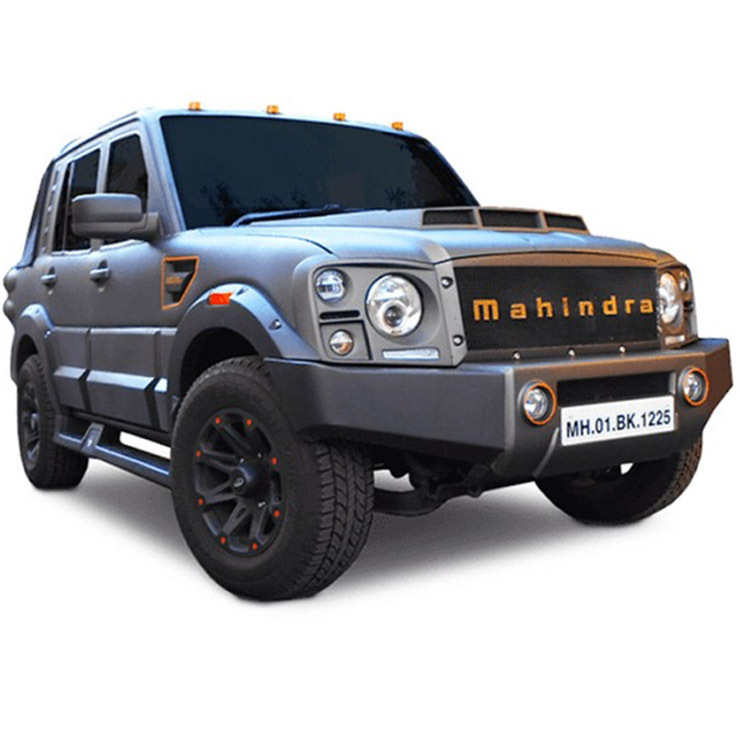 Mahindra & Mahindra offers a handful of really cool customization kits for the Scorpio. One of these is the Mountaineer kit that you can see above. The Mahindra Scorpio Mountaineer comes with a thoroughly updated exterior that ensures this Scorpio looks much more macho than the regular version. The front-end of this SUV comes with a custom grille, a new bumper, and a 3-pod headlamp cluster. The Mahindra Scorpio Mountaineer comes with a pick-up truck layout. The SUV also gets a custom bumper that has been equipped with towing rings, negative offset alloy wheels, side scoops, CRC steel rear metal bumper, snorkel, and off-road tires. The Scorpio Mountaineer also gets a custom grey paint with red highlights. 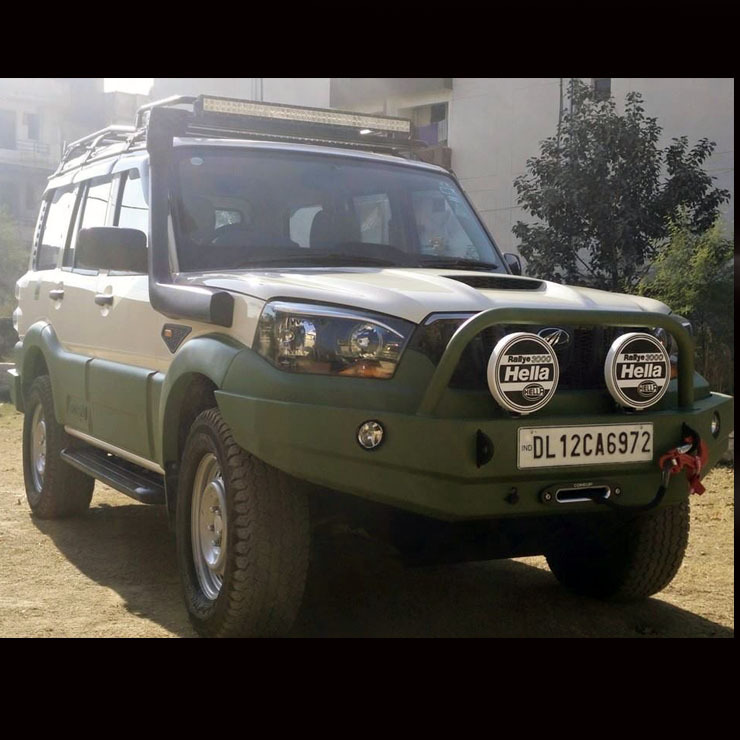 Mahindra Scorpio Darkhorse is another custom kit that Mahindra Scorpio Customizations offers. This Scorpio comes painted in a shade of matte grey paint that makes it look a bit more rugged than the stock version. 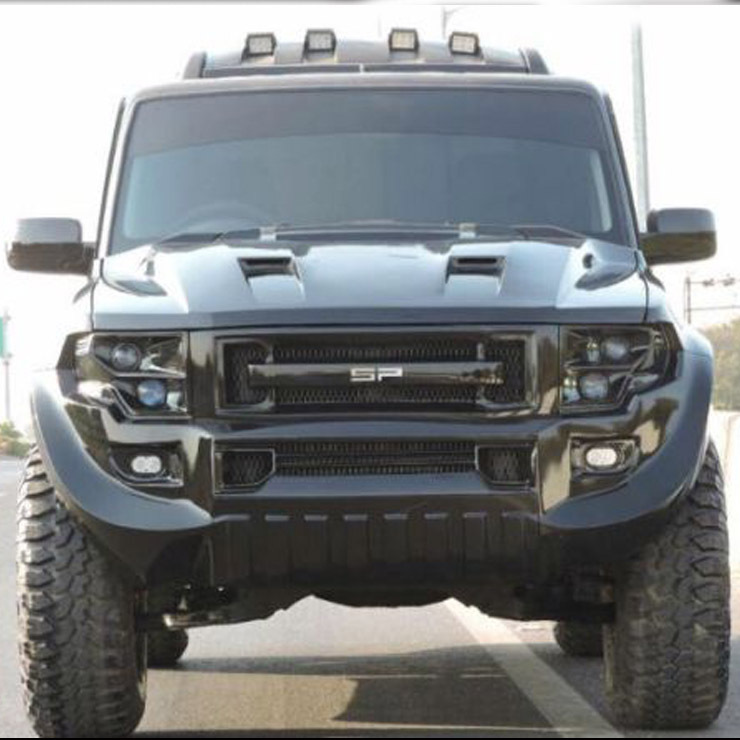 It also offers a more rugged-looking front-end that features an off-road-spec bumper and a custom wire-mesh grille. The front fascia also has a custom three-pod headlamp setup. The bumper carries a set of powerful fog lamps near the registration plate housing. The Darkhorse, like the Mountaineer, comes with a dual-cab pick-up body format. 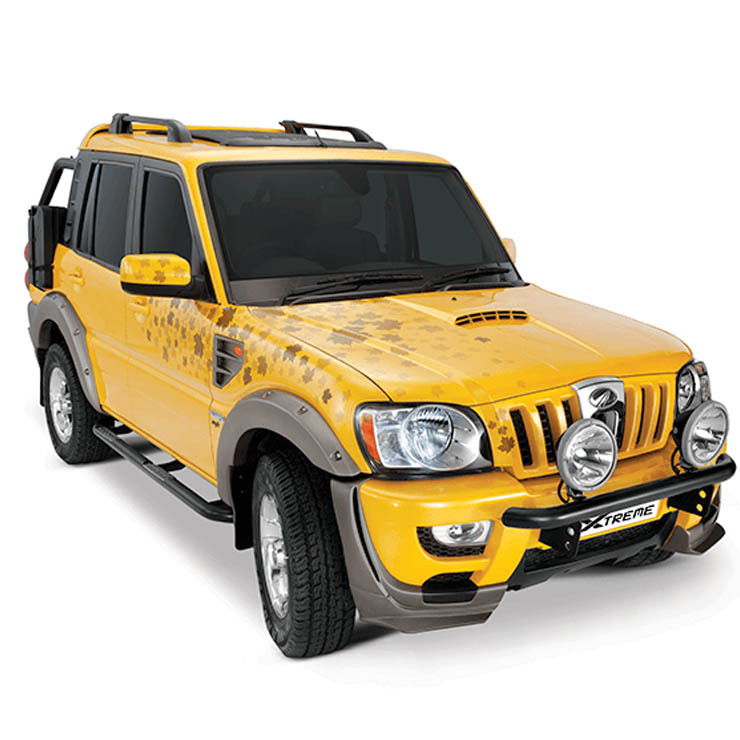 The Mahindra Scorpio Xtreme is yet another customized version of the popular SUV from Mahindra Customizations. The Xtreme sports a custom bull bar that features large auxiliary lamps. Mahindra has also added side guards and a roll cage to this SUV. The Scorpio Xtreme comes in a yellow paint shade. It gets flared wheel arches and faux air vents on the fender. The tail lamps are custom units and the rear bumper is also new. Other highlights include a jerry can for carrying extra fuel, cycle rack and even a sunroof. There’ also a cover for the cargo bay. On the inside, the car gets leather upholstery, custom floor mats, ambient lighting, head-up display (HUD), and an upgraded music system. Sarbloh Motors has come up with a modified Scorpio that features an off-road-ready look courtesy of the metal bumper, snorkel, auxiliary lamps, and a light bar on the carrier. It gets steel rims and is based on the S4+ trim. Of course, it is equipped with 4WD. Other highlights of this Scorpio include a snorkel, white-green dual-tone paint job, tow hook, tailgate-mounted spare wheel, and a jerrycan to complete that rugged off-roader look. You can also equip this Scorpio with a roof-mounted tent.